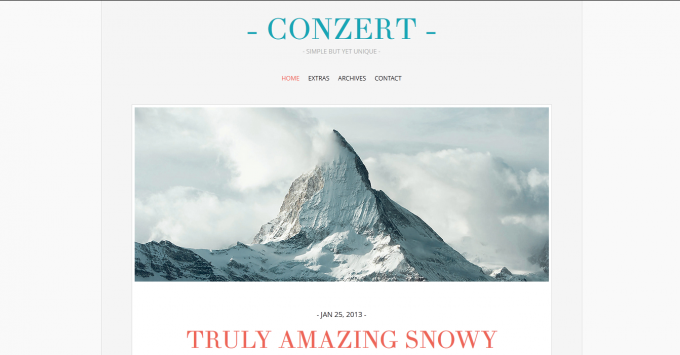 Cool, fresh and gorgeous are a few words that describe ‘Conzert’, one of the WordPress themes that will grab your attention. It fascinates with its clean and minimalist design for outstanding blogs and memorable sites on different topics. It is packed with a lot of customizable options that enrich its appearance. With this theme, you have everything you need to express and realize your ideas in an extraordinary way. It supports 5 different post formats and unlimited colors. You can use several custom page templates to complete the attractive look of your blog. ‘Conzert’ is a social friendly theme with special icons for most of the social networks disposed at the pages. It is a responsive WordPress theme to fit perfectly to all display resolutions, even on the smallest smartphones.